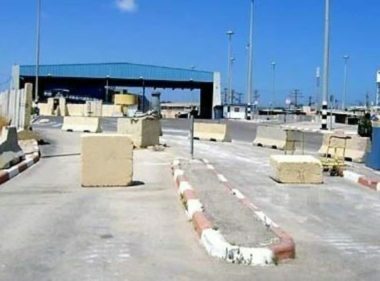 Israeli soldiers abducted, on Monday evening, a Palestinian merchant while crossing Beit Hanoun (Erez) Terminal, between the Gaza Strip and Israel, in the northern part of the coastal region. Media sources said the merchant managed to obtain a permit from Israel to leave the Gaza Strip and head to the West Bank, to buy goods and supplies to ship them back to the coastal region. The merchant, who was not unidentified at the time of this report, was moved to an unknown destination. It is worth mentioning that the army has lately abducted many Palestinians, including patients, merchants and students at the Erez Terminal, after originally approving their permit applications, and once they headed to the crossing, they were detained. Some of the abducted are patients who needed to go to Palestinian hospitals in Jerusalem, or Israeli hospitals, after receiving referrals for treatments, and many others are college students, or just trying to visit with family members in the West Bank.